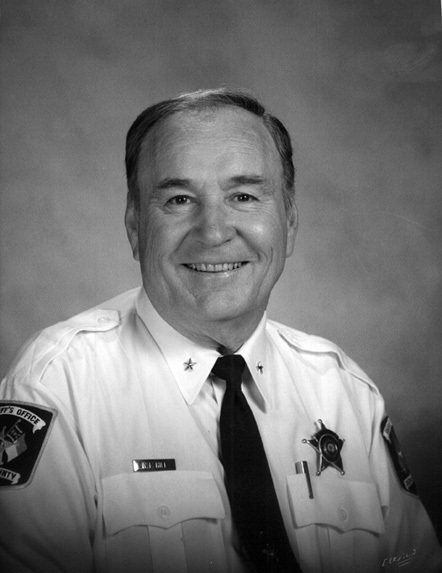 Durham native Worth Hill was Durham County sheriff for 17 years, from 1994, when he defeated Al Hight, to 2011. Before becoming sheriff he worked 30 years with the police department, retiring as a major in 1988. Hill modernized the sheriff’s office with the addition of Mobile Digital Terminals (the computers used in patrol cars) and with updated data and computer systems. He implemented GangNet for eastern North Carolina, a gang-related intelligence-gathering tool for agencies throughout the state. He supported community policing initiatives, including a program in the schools that allows deputies to teach in the classrooms, and instituted gang resistance and education awareness training for deputies. Hill and four others graduated from the prestigious FBI National Academy, including Mike Andrews, who later succeeded Hill. Notable distinctions the sheriff’s department achieved during Hill’s tenure included becoming one of only five departments in the state with a bomb squad and search and recovery and K-9 units, assisting with Secret Service and FBI operations, and providing security for presidential and dignitary visits. Hill was sheriff when the current Detention Facility opened in 1998.